Screen Doors & Sweet Tea: Hamburger Salad with a 20 Calorie Dressing! 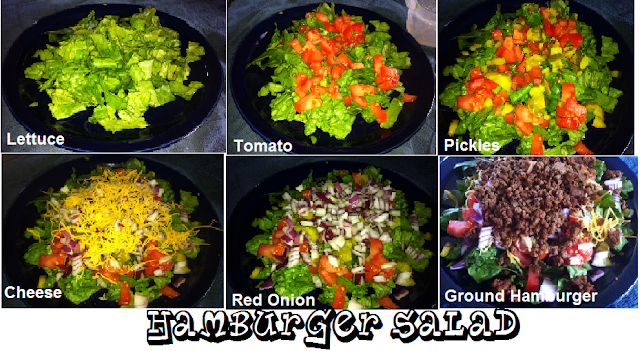 Hamburger Salad with a 20 Calorie Dressing! The tough part about dieting, or just simply eating healthy is wanting something you can't have. A burger for example. It CAN be made healthy, of course. However, what usually comes along with a burger that is even harder to resist? French fries, chips, or tater tots. By making a salad, I was able to cut out the sides, plus eat more for a lesser amount of calories. This salad is something I have been making for the past year off and on. I usually use a left over hamburger patty, ground meat, soy crumbles, or a frozen hamburger patty with less than 100 calories. 1/2 a cup of ground meat is the best because you'll have to crumble up your patty regardless, this makes it a little easier. Now the dressing really makes this FEEL LIKE YOU'RE EATING A BURGER. It is a little unconventional, but trust me and go with it because you can't beat 20 calories for just the dressing, with more than 2 tablespoons.